full story so far (free). At the beginning of the 18th century there was still no summer sea route to the estuaries of the great Siberian rivers. Neither was it known if the coast continued on to America or whether the continents were separate. Only the Chukchi knew this, for they had been trading with American Indians for centuries. In 1708 Peter the Great divided his empire into eight provinces of which the whole of Siberia was just one, with its capital at Tobolsk. Although Peter had travelled in Europe spending a lot of time in the Netherlands and especially in England, he never went to Siberia, and neither did any of the Tsars - until the last one was shot there. In 1711, Peter the Great demanded from Siberia even more money, furs, and other goods. he planned to open up more land for furs in the Far East and North Pacific. But some tribes in the Far East - the Chukchi (a federation of tribes), and the Koryak, remained independent. They defeated the Russians in battle time and time again, even when they had only stone-age weapons, and the Russians had guns. Now they too, had managed to acquire guns. So the overland routes to the Far East and the Pacific were blocked for the Russians. It was quicker and easier then to approach the Far Eastern coasts by sea, even if you took your boat from Europe down to the South Atlantic and round Cape Horn. Peter the Great sent the German Daniel Gottlieb Messerschmidt to explore Western and Central Siberia. He took ten years before returning to St. Petersburg with his notes and specimens. Most importantly he had discovered mineral deposits that could be mined, such as iron near Tobolsk and silver near Nerchinsk. Mining for the mineral wealth of Siberia was now to become even more important than the trade in furs, as an incentive to exploit Siberia. 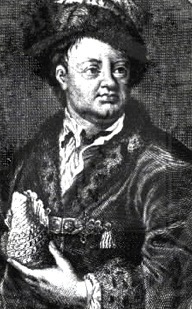 In 1721 and 1722, Messerschmidt was accompanied in his exploration by P.J.T.Strahlenberg, a Swedish prisoner of war held in Tobolsk since 1711, who while he was stuck in Siberia had decided he may as well explore the country. In 1719, Peter the Great sent geodesists Feodor Luzhin and Ivan Yevreynor to Kamchatka to make maps there and also of the Kurile Islands. At the same time they were to see if Asia and America were joined but failed to do this. The picture shows a Kamchatkan shaman and was taken from an 18th century illustration. In 1719 V.N.Tatishchev had proposed to Peter the Great that he sponsor a full survey of the Russian Empire. Tatishchev was sent instead to administer the state factory system in the Urals, but Peter the Great still carried out the scheme. In February 1720, he ordered that descriptions of all boundaries, rivers, cities towns, churches, villages, forests etc. in the Russian Empire be prepared for the survey. In May 1721 he called for an even more detailed survey. The project was not completed until two years after Peter the Great's death and was printed by Ivan Kirilovich Kirilov (1626-1737) chief Secretary of the Senate. In 1724, Peter the Great commissioned a retired Danish Naval Officer Vitus Jonassen Bering (born in 1681) to lead the First Kamchatka Expedition to the most eastern parts of the Russian Empire. Bering left St.Petersburg in January 1725, travelling overland to the Far East, with Aleksey Chirikov and Martin Spangberg, and a large team of navigators, seamen, shipbuilders, carpenters, blacksmiths and soldiers. They added more and more carpenters and blacksmiths to the party on the way. The party divided at Ilimsk. Bering took the southern route to Irkutsk to arrange the next stage of the expedition to Okhotsk on the Pacific coast. Spangberg travelled overland to Ust-Kut on the Lena. He spent the winter organising the building of fifteen barges to carry the whole expedition down the Lena to Yakutsk. The next spring the party all met up at Ust-Kut, with even more carpenters and blacksmiths plus two coopers, and sailed down the river. Chirikov remained at Yakutsk the next winter to collect additional supplies. Spangberg took the heavy stuff needed for building the boats to explore the north Pacific, by boat to Yadoma Cross. Bering led a massive caravan of baggage on horseback along the Yakutsk to Okhotsk Track. Most of his pack horses died on the trail and he had to leave catches of the two thousand leather sacks of flour among other things along the route. Bering just managed to reach Okhotsk before winter set in. Meanwhile Spangberg's boats became icebound 350 miles from Okhotsk. They had to leave the boats. Build sleds. And haul what they could themselves, leaving most of their stuff behind. They could not carry enough for their needs, and staved. They ate their horses, their leather harness, clothes and boots. They made new coats and shoes from the raw horsehide. Fortunately they found the flour that Bering had left. But they had no shelter from the winter wind except by burrows in the snow. Finally relief reached them from Bering. But when they were all reunited in Okhotsk, they could not make up for the missing supplies. This was because Russia's major Pacific sea port, governor at the time, Anton de Vieira, was tiny with ten Russian families in eleven small huts and only some dried powdered fish to see them through to summer, as they could not get crops to grow there. There were also no hard wood trees for timber and no means of obtaining useful things like iron nails to build their ships. They managed to make a boat tied together with leather strips to ferry them all across in two journeys to Bolsheretsk, the capital of Kamchatka, in July 1727. This had a small wooden fort, a church, houses, saloon and distillery. The expedition members, with the help of the locals had now to cross the mountains to the eastern coast to build their boats. On July 14, 1728 Bering's expedition set sail without him in their new boat, the St. Gabriel, to explore the north Pacific. The absence of transport ships capable of sailing from Okhotsk round to the eastern side of Kamchatka, had compelled Bering to the exploitation of the native Itelmen. Local men were forcibly rounded up from all the native villages, along with their canoes and dog sleds, to carry supplies for the expedition from Big River across the peninsula to the Lower Kamchatka fort some 500 miles. This meant that the Itelmens lost their hunting season which was crucial to their survival. They also lost many of their dogs which died from the excessive work load. They were given no compensation by Bering for their labour and losses except for a little money which was useless to them as there were no shops. The misery and resentment caused by the cost of the Bering expedition to the locals led to an uprising organised in 1731 against the Russians. By this time Bering was back in St. Petersburg. He arrived in St.Petersburg in March 1730, and proposed another expedition to the far East, this time stressing the need to explore the region more thoroughly. Meanwhile Bering's ship the St.Gabriel made another voyage in the Bering Sea and the Itelmen were fighting the Russians in Kamchatka. The government had organised a campaign led by Afasasy Shestakov, a Cossack leader based in Yakutsk. Shestakov, aiming at enhancing his political prestige had volunteered to suppress the Chukchi of the far north-east. The government provided him with 1500 men, a mathematician and geographer Michael Grosdev, and a co-commander Dmitri Pavlutsky with whom Shestakov argued. Shestakov and his forces clashed with the Chukchi in Penzhinsk Bay. The Chukchis despite their stone-age weapons defeated them. Shestakov was wounded in the neck by a Chukchi arrow. He managed to scramble on to a reindeer sled. But it was drawn by a Chukchi reindeer and carried him back home - his home, right into the Chukchi camp. Pavlutsky was still in Yakutsk when this happened. It was time for him to have a go against the Chukchi. He travelled to Anadyr. The Chukchi killed him and kept his head as a trophy. The defeat of the Russians by the Chukchi in 1730 encouraged their neighbours to the south. Smarting with discontent after their treatment by Bering, the Kamchadals combined under a leader named Fyodor Kharchin. after a bitter struggle, the Russians got the upper hand. When the causes of the Kamchatka uprising were investigated by an official sent from Tobolsk, Russians as well as Kamchadals were found responsible for the problem and were punished and executed. Back in St.Petersburg, the government - now under the Empress Anna, decided that the main problem was that far eastern countries like Kamchatka were too far from Yakutsk to be governed adequately from there. They transferred this responsibility to Okhotsk, on the Pacific coast. There was also concern about the long border with China. In 1726 Savva Raguzinsky was sent to Beijing as Russian ambassador. On his journey through the land of the Buryats and the borders south and east of Baikhal he had reported the lack of border defences and fortifications, mentioning Selenginsk as a place quite unprotected from border raids and the ideal place for a fortress. In 1827, Abram Petrovich Gannibal, or Hannibal, of the Preobrazhensky guard, was sent out from St.Petersburg. A favourite of Peter the Great who had arranged his purchase as an African slave from the Turkish market along with his brother - their sister died on the way. Now Peter the Great had died - those in government who wanted his favourite out of the way, took the opportunity to send Gannibal to Siberia to design the fort at Selenginsk. He was particularly good at designing military fortifications which is how he became important to Peter the Great. He returned three years later and was moved to Reval (Talinn). His second wife had ten children and he is not only the ancestor of Pushkin but many members of the British and European aristocracy. Meanwhile the region he left on the frontier of Russia and China now rapidly developed into an important trading and manufacturing area on the "tea route". Meanwhile the Bering expedition continued in the absence of Bering. Grosdev, at Okhotsk, was in charge of the scientific aims of the expedition. One of these was to search for the "Big Country" across the sea, where the Chukchis went to trade with the natives, and which it was thought must be the Pacific coast of America. 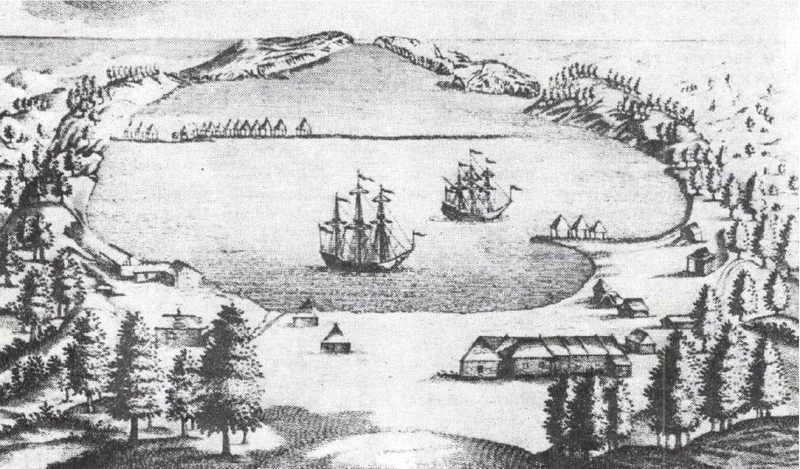 In 1732, Grosdev set out in Bering's St.Gabriel for a two month voyage. They made it to Alaska, and met up with the locals there. Unfortunately Grosdev's report was somehow lost. By the time he had rewritten it, Bering had been to Alaska himself and got the straits between the continents named after himself. Missionaries were sent from Irkutsk to convert the Yakuts to Russian Orthodox in 1731. They managed to tempt a few by gifts and a five year remission of yasak into becoming nominal Christians. People did not give up their traditional beliefs that easily. As with other Siberian peoples, the Khanti, Nenets, Buryats and also many Russians living in Siberia, the only Christian saint/god who was really accepted and popular was St. Nicholas (Father Christmas or Grandfather Frost or Santa Claus) who became adopted into the pantheons of existing gods. And is the only diety who has ever been detected by modern satellite technology, tracked by Norad on the days leading up to Christmas. Yakut society already had its own class distinctions before the Russians conquered them, with the Toyons at the top and slaves at the bottom of the social ladder. Under the Russian government, the slaves, serfs or bondsmen and women were bound to the property of their master or mistress, and therefore were not expected to be able to hunt to provide yasak in the form of furs for the Russian government. It was in order to increase her revenue from Siberia, therefore, and not from pure altruism, that the Empress Anna, in 1733, decreed that all slaves in Yakutia must be freed. The Toyons wanted compensation. The Second Bering Expedition to Kamchatka set out from St. Petersburg with the approval of the Empress Anna. This time the expedition was vast and included seven contingents under Bering. The contingent from the Academy of Sciences was made up of 600 people with nine loaded wagons and forty packhorses carrying their supplies of instruments, paper, ink, pens, paint and more than two hundred books. They were also given documents to permit them to examine any archives, and to engage interpreters and guides at the expense of the locals. They also had permission to buy any necessary items at the Academy's expense as well as an increase in salary to cover their extra expenses during the trip. Among the academics was Louis de L'Isle de la Croyre, the French astronomer, stepbrother of Joseph Nicolas de L'Isle who was a geographer at the Academy of Sciences. Also Johann Georg Gmelin pictured left, (1709-55) a doctor, chemist and naturalist, and Gerhardt Friedrich Müller (1705-83) a historian and ethnographer interested in the Far East. Gmelin and Müller stayed together most of the journey. They ventured no further east than Yakutsk where they stayed 1736-7, reluctant to leave this outpost of civilization. Then they returned back to St.Petersburg, attempting to justify their trip by writing about their observations as they traveled through Western Siberia on their return journey. They arrived back at St.Petersburg in 1743. Not surprisingly, since they did not remain with the expedition, they found it impossible to get their expenses repaid and worse, were put back on their previous salaries although they felt their length of service, heavier workload, and positions as professors entitled them to more. Gmelin signed a new four-year contract in 1747, on condition that he could spend a year home in Tübingen. This had to be guaranteed by his friends Müller and Lomonosov. But Gmelin, having escaped home, remained in Tübingen, and Müller and Lomonosov had to pay his bail. Euler intervened on their behalf and Gmelin was forced to pay them back. Gmelin had annoyed the Russian academics and politicians because he wrote about the resentment of the native people for the Russians and the cruelty they were subjected to. The massacres of villages, the brigands and the native uprisings. He wrote about the lack of law enforcement and the ignoring of central government by local officials who suppressed and ruled by horrible cruel punishments. He wrote about the drunken orgies and the religious fanatics. The discomforts of being stung by swarms of mosquitos in summer and suffocating in stuffy dwellings in winter. He was generally critical of the Russians in Siberia and they did not like that. The making of "A Description of the Shores, Rivers and Bays of the Arctic Sea from the Estuary of the Lena River" by Khariton Laptev and Semyon Chelyuskin and the log of the two-mast "Yakutsk" by Vasily Pronchishchev and signed by Semyon Chelyuskin. Khariton Laptev (born 1700) and his cousin Dmitri, one year younger, came from land-owning families in Russia, a place called Yelikiye Luke. In 1715 they went to the Naval Academy and become midshipmen. In December 1737 Khariton was promoted from midshipman to Lieutenant by the Empress Anna, and sent to join the northern expedition as commander of the "Yakutsk", to replace Vasily Pronchishchev. Pronchishchev had been at the Naval Academy at the same time as the Laptevs. He and his wife Mary who accompanied him had died of scurvy on the ship's first arctic voyage in 1735. Khariton Laptev and his cousin left St.Petersburg for Yakutsk at the end of 1738. In early June 1739, the "Yakutsk" left the river port of Yakutsk with a crew of forty-five who had been on the first voyage, including navigator Semyon Chelyuskin, who had also organised the building of a factory near Yakutsk to make metal parts for the expedition's ships. They failed to get as far north as on the first voyage and ended up mapping the Taimyr Peninsula, since the ship was holed when it became stuck in the ice, and had to be abandoned. Dmitri Laptev had arrived in Yakutsk for the first time in 1735 with Alexei Chirov. He was responsible for dealing with the shipment of goods for the northern expedition along the river system of the Lena basin. Then he succeeded Lieutenant Pyotr Lasinin who had died, on the "Irkutsk" which was to go along the coast east of the Lena estuary. They were to map the shore all the way to America and down to Kamchatka. They did not do this. Bering ordered Dimitri back to St.Petersburg, and he returned to Yakutsk later with his cousin Khariton. He was to map the Kolyma river and the Anadyr river. His ship was trapped by the ice at the mouth of the Kolyma river in 1740, and had to remain there all winter. Their provisions were used up. All the crew suffered from scurvy and many of them died. Dmitri Laptev constructed a lighthouse to show their whereabouts to their companion ship, which was stuck by the ice at the mouth of the Alazei river for the winter. The transportation of Bering's second expedition from Yakutsk to Okhotsk required over 500 porters and drivers. A burden which fell on the Yakuts. When Bering arrived on his second visit to Kamchatka, in 1740, he again pressed the Itelmen and their dogs into his service. The Itelmen - remembering his last visit - refused. This led to an armed battle in May 1741. Bering and his men won by using grenades against the Itelmen men and their families. They captured and flogged the leaders of the rebellion. The effect of Bering's two expeditions to Kamchatka were to completely undermine the traditional economy and way of life there, and destroy it. The Bering expeditions established a route for freight from Yakutsk to Okhotsk and the Pacific. But they are still waiting for their railway first planned a century ago. In 1752 the Yakut(Sakha) Toyons were empowered by the Russian government to administer corporal punishment and imprisonment on their subjects accused of crimes. The Toyons had absolute power over their people, since at the same time the rest of the people were deprived of the right to complain to the Russian government in cases of unfair judgements. The privileges of the Toyons were further extended to new yasak regulations which divided the Yakut population into five categories, the amount of hay-meadow distributed to each family for its use being dependent upon the amount of yasak produced. This system allowed the Toyons to take over the best meadows for themselves and they could treat the less important members of the nasleg (the administrative clan unit) as serfs. Like Russian serfs, no Yakut was allowed to travel beyond the confines of his or her district without a permit. Not all Toyons, and districts were as badly influenced by Russian regulations and customs. During the 18th century, the majority of Yakuts retained their individual lands as freemen, and the old clan system of communal land use and mutual aid still prevailed. In 1767 the Yakut Toyons managed to insist and obtain representation at meetings of Catherine the Great's Legislative Commission. This was followed by more specific requests to central government including a further extension of the Toyon's privileges and powers. In 1787 more than 6,000 Yakuts migrated to China from the districts of Olekma, Yakutsk and the Viluy. They prefered to live under Manchu rule. 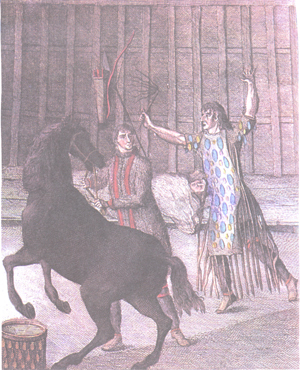 In 1789 the year of the French Revolution, the Yakuts asked for the appointment of police inspectors familiar with Yakut customs and language. The Yakuts were ahead of other nations in the Russian Empire in demanding their civil rights. This may seem strange since Yakutsk was so remote and isolated, but all sorts of people came there, as travellers, explorers, adventurers, prisoners of war, and political dissidents and thus the Yakut Toyons came to hear what ideas were around in the outside world and to have their children educated by world class academics. But their proposals were not accepted by the Russian government. Expeditions 1755-1780 and Captain Cook's 3rd expedition. In 1760 two merchants Shallahourov and Bakov started from the mouth of the Lena for the journey eastward to discover the north-east passage. They had been planning this trip since 1755. After three years, in 1763, they were finally beaten back by the ice, to the mouth of the Kolyma, where they spent the winter in a hut. Half of the members of the expedition, including Bakov, died of scurvy. Shallahourov and the other survivors persisted in 1764 further east but eventually they all died. On the third expedition in 1776, which was led by Captain James Cook to explore the Pacific, the ships first explored the shores of the North Pacific, improving on Bering's charts. They met Russian fur traders on Unalaska, before going south again. On February 14th 1779, Cook was murdered in Hawaii. Captain Charles Clerke, of the Discovery took over command. The ships went back north to Kamchatka for supplies. Picture shows Petropavlovsk in the 18th century. In 1771 a Polish political exile, Maurycy A. Beniowski had led a rebellion at Kamchatka and had then escaped on a French ship to France. When two more European ships arrived at Kamchatka, the Russians there were afraid at first they had been sent from France to attack the Russians on Kamchatka, and were pleased to find they were English and helped them. After a Russian clockmaker at Petropavlovsk fixed their chronometer K.1 - made by Larcum Kendall to the award winning design by John Harrison, the ships headed back north again to look for the North-West passage once more. Their plans were to find a sea route between Asia and America that would lead to the Atlantic. But they did not get far. The Discovery was leaking, and Clerke was seriously ill. They headed back to Kamchatka. Clerke died and was buried at Avacha Bay. Second Lieutenant James King took command of the expedition. When they arrived back in England October 1780, the Admiralty took all the journals including private notes made by all the officers. The Larcum Kendall chronometer was taken to Greenwich to be overhauled and given to Vancouver to take on his North Pacific expedition. Two ship's officers at least, were extremely annoyed at their notes being taken from them. Joseph Billings and John Ledyard both intended to return and explore the route from Siberia to America.